If you are shopping for a tall fan, be it tall tower fans or tall stand fans, read on as we have listed the tallest tower fans and tallest pedestal fans in a nice list below. Tower fans and stand fans run quietly, are easy to operate and are highly effective when it comes to providing a cool breeze. Combine all these benefits with portability, safety, and their stylish design and you have a great choice for a cooling accessory in your home or office. Shopping for a tower fan or stand fan can be an overwhelming process so be sure to check out our useful guide which can help you determine which kind of fan is best for you. There are quite a number of tall fans in the market and they all have pros and cons. The taller pedestal fans tend to be quite powerful, so expect a lot more airflow output with the taller models. Below we have put together the following list of the 8 of the tallest fans available in the market. As far as tall tower fans go, this was the tallest one we could find. The Lasko T48303 offers a 4-speed operating mode, which is easily adjustable, runs quietly and shifts smoothly between the modes. The fan provides widespread oscillation to cover the entire room. It has a remote control feature with multi-function. To avoid misplacing the remote every now and then, the fan features a remote storage compartment in its stylish design. The Lasko T48303 comes with an inbuilt ionizer for fresher, healthier and cleaner air. It also has an impressive electronic timer that can be set up to 7 hours to save on energy. 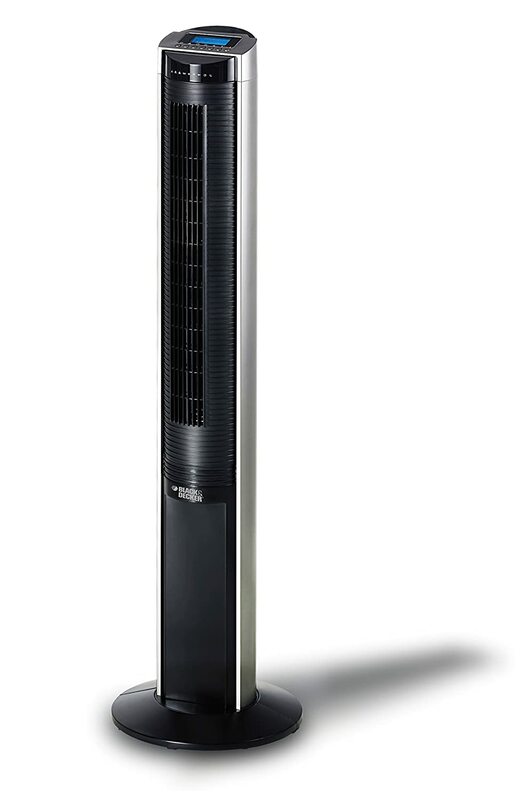 Like all Lasko tower fans, it features a slim and stylish design, at 48 In. in diameter and a height of 4 ft. It operates without the need for batteries. The fan ships at 12.5 pounds and requires simple base assembly. Much like the Lasko 4821, the Lasko 4820 features a slim, compact, portable and stylish design. The shipping weight of the Lasko 4820 is 12 pounds but it has a total item weight of 14 pounds. It is 48 In. in diameter and has a height of 4 ft with a widespread oscillation feature. The Lasko 4820 is equipped with a fresh air ionizer and bears an operating capacity of up to three-speed levels. It is fitted with an electronic timer allowing for automatic shut off to conserve energy. Like all Lasko tower fans, the 4820 comes with a multi-function remote and has an onboard storage compartment for the remote. It also has lighted electronic controls. The Lasko 4820 is designed to operate without the need for batteries and comes in either metal or plastic with a carry handle. The available color is gray. Again the assembly of the base is required after shipping. There a number of other Lasko fans at this size available too. The Black & Decker BDTF 4700R is a great alternative for those of you who are after an alternative to the Lasko brand of tower fans. One of the most notable and convenient differences is that this tower fan does not require assembly after shipping. It features a simple yet elegant and functional design with 47 In. in diameter. The overall weight is 11 pounds, though its shipping weight is 14.2 pounds. This tower fan comes with three-speed modes namely; the sleep mode, wind mode and natural mode. It has an LCD display and has remote control access. It comes in black and does not require the use of batteries in its operation. Though the Black & Decker BDTF 4700R is powerful, it is designed in such a way that it has limited energy consumption. The Excelife LF-45R features one of the best designs when it comes to style. It comes equipped with soft-touch digital electronic controls as well as remote control access. It has a comfort speed adjustment among the available three-speed modes namely; normal, sleep and natural modes. It features an 80-degree oscillation capability in its 45 In. diameter design. 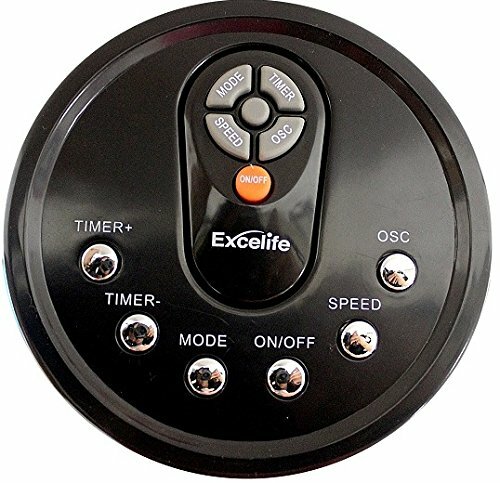 The Exelife LF-45R does not require batteries but needs assembly after shipping. It weighs 11.2 pounds and has a carry handle. One of the tallest stand fans you will find on the market the Maxxair stand fan has a maximum height of 84 inches and can adjust down to 60 inches as well. This fan is high velocity, so if you are just wanting a small breeze this may not be for you. At the highest speed, this fan puts out 4800 CFM which is a lot and makes this fan great for commercial applications. This tall stand fan measures 76 inches at the maximum height. Much like the Maxxair fan above, this is another power / industrial grade pedestal fan, in fact, this fan blows a whopping 8000 CFM on maximum setting which again, is great for the larger more open spaces. The fan comes with 2-speed settings which will give you a little more control over the output and also has a 15-degree tilt in which you are able to point the fan head in the direction you need the air to flow. Overall the fan is said by customers to be a little loud, but with such a high output, that is to be expected, regardless, the Q-Standard has very positive feedback from its purchasers. Little brother to the Maxxair 30, this 22 inch bladed fan measures in at 71 inches high. The fan oscillates 90 degrees and can be adjusted down to 60 inches high. With an output of 4100 CFM it is still a very powerful fan in terms of its airflow. With 3 speeds you have a little bit of control over how much airflow you want to be output. The Air King 9420 measures in at 64 inches tall. It has 3 speeds for good control over airflow. Being an industrial grade stand fan this fan also moves a lot of air with the high, medium and low settings, pushing out Moves 3670, 3330 and 2940 CFM of air respectively. The height can reduce as far as 54 inches and the Air King is ETL and OHSA approved. These 9 fans will hopefully help reduce the amount of time and effort you would have spent searching for a tall tower or stand fans. Do you own or have you tried any of these fans?